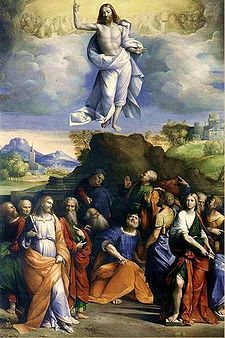 Today is the Feast of the Ascension of Christ. Really. Doesn’t the entire concept just blow the mind? Well, it does mine, anyhow. Now, I have written before about this, and how it kind of always boggles my mind. Because I am a visual kind of gal, I always get stuck in the imagining of this event, in the unimaginable visuals. My mind wants to do a whole movie panorama on it, more old Cecil B DeMille flicks, less Spielberg…but I digress. My point is that I can get all hung up in trying to SEE this, visualize and understand it….which of course totally misses the point. As usual. But there are two cool parts to this that I could spend the rest of my life meditating upon, and in fact it would surely do me much good. I won’t, but I should. The first part is the whole concept that Jesus went to prepare a place for us. He went to get things ready for us, at HOME. Home. Not our current abodes, apartments, houses, condos…but our true home. And that is with Him, eternally, in heaven (I hope and pray). I mean, how cool is that?? I don’t know about you, but I’m not the greatest hostess on the planet. I failed Martha Stewart 101. I have to write post-its to remember to put nice folded towels in the guest bath. But here, the God of the Universe, of everything, is heading off to prepare a place for us! Now I don’t know what that entails in heaven and all, but even still, he’s already on the details and is prepping with each of us in mind. Really, how cool is that? I know I know, this is really talking about bigger picture stuff, but even so, God is in the details too and you know it. Ever looked at the marbling in granite?? Or the marbling in marble? Huh? Stared into a tiger lily? Don’t tell me that God doesn’t pay attention to the tiny details…so I can marvel that Christ left the apostles, ascended even (another spectacular detail), to go and prepare a place for us, the best place: Home. Ahhhhh……joy. Nope, Christ ascended as they watched (and surely, gaped and pointed, nudged and grabbed each other and held out their hands and maybe both laughed a bit and cried a bit too). But certainly they had to be electrified; how could you not? Surely, this very change from followers of the earthly bodily Jesus to witnesses was facilitated by this ascension. I mean, literally, they witnessed it. They witnessed it all: yeah, the ascension, but also Christ himself on earth, his miracles, his passion, his resurrection, his heart, his voice, his smell, his smile. They knew him, like the world could not. And thus they were the first, sent out with a bang – a spectacular electric jolt – to bring that excitement to everyone. Big job, but then again, big cool. Much to think about with this day…. *disclaimer: some of this post from several years back. Very swamped w/ family life, but liturgical life is still so cool that I want to mark it, always! This entry was posted in art, catholic, catholic life, feast day, liturgical year, prayer, Uncategorized and tagged Garofalo, salvadore dali by coffeemom. Bookmark the permalink.